This chapter mentions about major references in the past from scholars, historians and travelers. There might be chances that works of some scholars do not appear here, in that case it should be considered not intentional but ignorance on my part. He further mentions that the country around this is uncultivated hillocks, without inhabitants. At a very long distance from the hill there are villages where the people all have bad and erroneous views. On account of the inaccessibility of the monastery, Faxian was unable to visit the site and so narrated the information that he gathered from other travelers. Is it a reference of Kanheri complex? Joao de Castro (1538-39, Primeiro Roteiro da Costa da India) – The first definitive reference of Kanheri available to me comes from Joao de Castro, a Portuguese naval officer and the fourth viceroy of Portuguese India, who visited India in 1538-39. He mentions that about a league and a half from the ruined city of Thana, among the great hills, in a most grand high and round rock, from the plain below to the highest point, are many sumptuous temples and noble many storied palace-like buildings, with images, columns, houses, porticoes, figures, pillars, cisterns, temples and chapels all cut in rock, a thing certainly not within the power of man, so wonderful that it may be ranked among the seven wonders of the world, unless, instead of thinking them to be the work of men, we attribute them to spirits. He mentions about a magnificent temple outside of which, in a courtyard, are two high columns. The column to the right hand has on top a wheel like a Catherine’s wheel, places above four lions beautifully carved. The column on the left hand has some men supporting in their hands a great ball like the world and looking as if they were in much borne down by the weight. This magnificent temple seems to be the present Great Chaitya cave. Castro mentions about 83 houses and 15 chapels. Garcia de Orta (1563, Colóquios dos simples e drogas he cousas medicinais da Índia) – He was a Portuguese physician, who traveled to India in 1534 and later got the island of Bombay on lease however he never lived in Bombay. He mentions two underground temples in Salsette, one of which in a hill larger than a fortress of Diu and might be compared to a Portuguese city of four hundred houses. There were 3000 houses with images carved in stone. Each house had a cistern, with conduits bringing rain water. This might be the Kanheri cave complex as there is no other nearby complex which can be that large as mentioned by him. Diogo de Couto (1559, Da Asia Decada) – Couto mentions that in the center of the island of Salsette, there exists a wonderful Pagoda of Canari, thus called from its being supposed to have been the work of the Canaras. About the huge Buddha statues he mentions that these giant figures are twice as big as the Giants exhibited on the Procession of the Corpus Christi Feast in Lisbon. These are executed so beautiful, elegant, and so well executed that even in silver they could not be better wrought and made with such perfection. He writes that these caves were inhabited by Hindu jogis who were living on alms. The chief jogi was converted to a Christian by the Priests of St. Francis, and called as Paulo Raposo. They also converted another jogi, and named him Francisco de Santa Maria, who gained more reputation than the chief jogi. The latter became an evangelical preacher and converted many into Christians. The first Christian priest who lived here and converted many jogis was Fre Antonio de Porto, of the order of Menorites. He constructed a church dedicated to St Michael while his stay which probably he achieved by converting the chaitya cave into a church. Antonio de Porto was also informed of a novel, wonderful, and intricate labyrinth not to be compared to any in the world. Couto was told by the natives that this labyrinth was constructed by the Hindu king Bimalamenta who ruled before one thousand and three hundred before from east to west of India. Couto tells that from the foot to the top of the hill, there are more than three thousand small room like cells, each of them having a water cistern at its door, and what is more wondered at is, that there is an aqueduct constructed so ingeniously, that it passes through all the three thousand apartments, receives all the water from that hill, supplies it to the cisterns that are at the doors of the rooms. John Huighen Van Linschoten (1583, Itinerario) – Linschoten did not mention Kanheri however about the cave temples at Salsette he did mention about a complex where Gray Fryers had made a cloister called S. Michaels. He mentions that there are many galleries of the pagode and chambers encircling the hill. He also mentions water cisterns against these pagode and chambers. He tells that there are 4 such circles or galleries amounting to 300 houses or pagodes. He tells that all are carved with fearful, horrible and develish forms, that it is wonderful to behold. Sir Thomas Herbert (1625, Some Years Travels into Africa and Asia the Great) – He was an English traveler and historian. He came to India during his tenure of embassy to Persia. He was the first person to publish Persian accounts in English. He mentioned two temples of profane worship at Salsette. He provided very less detail, except a notice that one of these had three galleries. This three galleries temple might be the chaitya cave of Kanheri. John Fryer (1675, New Account of East Asia and Persia) – He was an English doctor and traveler who traveled to India in 1673. During his stay in India, though he was more focused on medicine, however he made stray references of the surrounding. He referred the hill as a city cut out of a rock, where is presented Vulcan’s forge supported by the two might colossus, belied in the middle with two globes. Next comes a temple with a beautiful frontispiece. Within the porch on the each side stand two monstrous giants, where two lesser and one great gate give a noble entrance. Gemelli Careri (1695, Giro Del Mondo) – He was an Italian traveler, who is well known for his travel around the world. He started his journey in 1693 and published his accounts in 1699. He mentions about various caves here, including the Great Chaitya cave. He provides measurements of these various caves in spans. About the stupas, he writes that these are supposed to have been sepulchers of the ancient gentiles and he wonder how it could be as there is no opening to put a body or ashes. Alexander Hamilton (1720, New Account of East Indies) – He was a Scottish sailor and merchant who traveled to Bombay in 1688. He set up his private company and started operating from Surat. Later he became the commander of the Bombay Marine in 1717. In 1727 he published his book, New Account of East Indies. He mentions Kanheri as Canra which is the only city on Salsette island. It was all hewn out of rock, have antique figures curiously carved in the rock and many good water springs. He mentions that it was inhabited only by wild beasts and birds of prey. Charles Boone, then governor of Bombay between 1716 and 1720, made drawings of temples and statues along with a very good description of these caves. He writes that this stupendous work must have been the labor of forty thousand men for forty years. Time and zeal of the Portuguese have defaced a great deal. When they first took the island, imagining those places to be the habitations of spirits and demons, they used constantly to discharge their great guns at them. John Henry Grose (1750, Voyage to the East Indies) – Grose described the history of Salsette island in very detail however for Kanheri caves he only provided a stray reference. He referred the area as Canara and mentions that the excavations are large in numbers, and contemporary of Elephanta however none of them approaching to it in bigness or workmanship. Anquetil du Perron (1760) – De Perron is celebrated as the first professional French scholar of Indian culture. He stayed in India for seven years. He visited Salsette in December 1760 and left a detailed account of the Kanheri caves. He visited almost all the caves and numbered these, however these numbers were revisited by West few years later. This was the best exhaustive account of the caves till that date. Du Perron though numbered the caves during his visit however it was not proper, which made Bhau Daji Lad to renumber these in 1860. Charles Boon (1780, Archaeologica vol VII) – Boon referred the area as the city of Canorin. Chaitya cave dimensions provided as 84 feet long and 46 wide supported on 34 massive pillars. The stupa is 27 feet high. Hector Macneil (1783, Archaeologica vol VIII) – He referred the area as Cannara. He writes, ‘On my first approach to this singular and astonishing scene, I was filled with new wonder at every step; palaces, statues, giants, monsters, and deities seemed as if starting from the bowels if the earth to open day’. Though he might have visited many caves, if not all, however he restricted his description only to the main Chaitya cave. He noticed two large Buddha statues, which he said that these are more English rather than Hindu. The couple donors at the entrance he took as dancers. He suggests that there would have been a wooden gallery between the first and the ground floor access to which might have provided via wooden staircase. After visiting many other caves at site, Macneil suggests that this was not merely a place of worship but a permanent residence for a set of people who would have inhabited it for quite some time. Presence of water cisterns at each cave also strengthens this view. William Hunter (1785, Archaeologia vol VII) – He visited various cave shrines in 1781 including Kanheri, Elephanta and Jogeshwari. He tells, “In different parts of the island of Salsette, and in the neighbourhood of that of Bombay, we meet with some most stupendous monument of human labour and ingenuity; which would be matter of admiration in any part of world, but must astonish us still more, when we find them in a country remarkable for the indolence of its present inhabitants”. He referred these caves as the caves at Canara. He mentions that there are numerous caves at this site however he gave his attention of major caves. He noticed the two large size Buddha statues whose measurements he provides as 20 feet high. His account only covered the Great Chaitya cave. At last he mentions, “from considering the incredible labour that must have been employed in cutting these caves in hard and solid rock, the idea has been suggested, that it may, at the time the work was performed, have been of a softer consistence, and been afterwards hardened by exposure to air.”. Anton Pantaleon Hove (1787, Tours for Scientific and Economic Research) – Hove traveled to India on a mission to understand various crops and carrying other scientific experiments. However been a keen observer, he writes few stray references of monuments and other buildings. Though he was not set up at Bombay however during his visit to the city, he visited these caves. In his journal, he gave attention only to the Great Chaitya cave. He mentioned that the relic shrine at the end of the hall was still worshiped by the Hindus. George Valentia (1802 , Voyage and Travels to India and Ceylon) – Valentia only described the main Chaitya cave as he did not have much time to visit all the caves there. He mentions that the peculiar ornament of the cave are two gigantic Buddha images which are nearly twenty feet high. These are exactly alike and in perfect preservation in consequence of their having been christened and painted red by the Portuguese, who left them as an appendage to a Christian church. He tells that in one of the large square caves which adjoin that above described, are many figures, and one that is very remarkable shows Vishnu himself in the act of fanning Buddha with a chourie. He tells that it is not only the numerous caves, that give an idea of what the population of this barren rock must once have been, but the tanks, the terraces, and the flight of steps which lead from one part to another; yet now not a human footstep is to be heard, except when the curiosity of a traveler leads him to pay a hasty visit to the ruined inhabitation of those, whose very name has passed away, and whose cultivated fields are become an almost impassable jungle. I wonder that how significant this statement is even in the present context. Henry Salt (1806, Transactions of the Literary Society of Bombay vol I) – His paper, ‘Account of the Caves in Salsette’, included the plan and drawings furnished by Major Atkins of the Bombay establishment. He referred the caves as the Kenery caves located in the city of Canorin. Though he visited many caves however his account has details on cave no 1, 2 , 3 and the Darbar cave, Cave 3 and the Darbar cave getting maximum attention. The Buddha figures are mentioned 23 feet high. He points to a small Buddha image, above the central door of the entrance to the chaitya hall, which wears a conical cap. He compared this with Chinese deity, Fo , who is often supposed to be same as Buddha. The measurement of the chaitya hall is given as 83 feet long and 30 feet broad. Reginald Heber (1825, Travels) – He was an English clergyman who served as the Bishop of Calcutta till his sudden death at the age of 42. In June 1824, he sets out with few companions on the tour of north India to be ended at Bombay. He arrived Bombay in April and stayed there for four months. In his travelogue, he mentions about Kanheri caves however put more emphasis on the Darbar and Chaitya caves. John Vaupell (1837, Transactions of the Bombay Geographical Society) – He described these caves in short and brief. Dr. James Bird (1839, Historical Researches) – Dr Bird tells that immediately in front of the large arched cave and on a ledge of the mountain, some thirty or forty feet below, there are several small Thopas or monumental receptacles for the bones of a Buddha or Rahat, built of cut stone at the base. They were once of a pyramidal shape, but are now much dilapidated, and appear like a heap of stone. He further tells that the largest of the topes selected for examination appeared to have been one time between twelve and sixteen feet height. It was much dilapidated, and was penetrated from above to the base, which was built of cut stone. After digging to the level of ground and clearing away the material, there was found a circular stone, hollow in center and covered on top with a piece of gypsum. This contained two small copper urns, in which were found small pieces of gold, a ruby, a pearl and a small gold box and a silver box. Two copper-plates were also found with these urns. These are the only such plates found at Kanheri, however, unfortunately these are not traceable at present. James Fergusson (1843, Journal of the Royal Asiatic Society vol VIII) – He provided a small account of these under his article titled ‘Cave Temples and Monasteries of Western India’. J Stevenson (1850, Journal of the Bombay Branch of Royal Asiatic Society vol V) – Though various travelers and scholars mentioned above talks about miscellaneous inscriptions of the site, however it was Stevenson who first published few of these in 1850. Paris-plaster castes of these inscriptions were obtained from the cave commission setup by John Wilson. Stevenson examined only two Pali inscriptions and attempted their translation. In 1852, he read another article to the Bombay Royal Asiatic Society on historical facts and names found in the Kanheri inscriptions. He tells that the most ancient name found here is that of Chanakya, the prime-minister of Chandragupta Maurya. He says that he is referred here with his gentile name, ‘Damila’. He further takes Rohini-Mitra to be in relation with the Pushyamitra family of the Sunga dynasty. These two conclusions of his were of course incorrect however he was right in noticing Gautamiputra Sri Yajna Satkarni but he took these as referring to two different Andhra sovereigns. About the architects of the cave, he identifies Dhanuka-kata with Xenocrates as some another inscription mentions that the architects were Greek. He suggests that Buddhaghosha mentioned in an inscription here probably refers to the famous Buddhist monk of 5th century CE who later moved to Sri Lanka. He also points to a reference of Mahakshatrapa as a minister of this race engraved an inscription at Kanheri. Among the places, Stevenson tells references of Kalyan, Wasai, Nasik, Sopara found among the inscriptions at Kanheri. Stevenson read an inscription as ‘Sakya-datya-lena’ and based upon this he tried to establish the theory of ‘Buddha Tooth Relic’. he suggest that this relic was temporarily deposited in this cave Its permanent deposit place was the large stupa opened by Dr Bird as the copper-plate found inside is a conclusive evidence of this. On the date of the caves, Stevenson takes help of the copper-plate charter which has number 245, and taking it as equivalent of 189 CE. None of his deductions, however, were correct. He also provided translation of about 18 inscriptions in this paper. Many of his translations were rectified to a great degree by later scholars. E W West (1860, Journal of the Bombay Branch of Royal Asiatic Society vol VI) – He was the first scholar who first published the copies of as many as 60 inscriptions of Kanheri caves . He provided the facsimiles of then available inscriptions. His article was also accompanied with the plan and description of almost all the caves. He also carried out excavations of the stupa gallery. Among the many small stupas, Bird took the single largest one for excavation in 1853. From his excavation, he concluded that this stupa was a sixteen-sided polygon topped with a circular dome. At various heights, it has been surrounded by tiers of sculptures, remains of seven of these were found among the ruins and about 10 at the lowest level were in situ. The dome of the stupa was already broken into before his time and its relics were emptied out. He also excavated eight small stupas however did not found any relics. He also carried excavation in cave no 13 which resulted in some interesting findings. He found many dried clay seals carrying a figure of Buddha with an inscription. 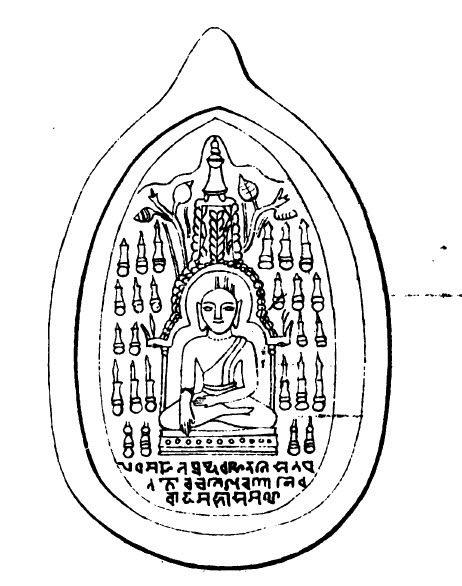 The inscription is the famous Buddhist formula, ‘Ye dharma hetu prabhava hetun teshan Tathagato hyavadat-teshan cha yo nirodha evamvadi Maha Sramana’. All the seals carrying the figure of Buddha is made from same source as same defect occurs in all. He also found two stone pots inside which were found five copper coins of the Bahmani dynasty of 15th century CE. James Burgess (1881, Inscriptions from the Cave-Temples of Western India) – He was the Government Archaeological Surveyor and published few inscriptions of Kanheri with Bhagvanlal Indraji. Their emphasis was on the Pehalvi inscriptions. Henry Cousens (1882, The Bombay Gazetteer) – He contributed for the text in the Bombay Gazetteer published by J M Campbell. He first consolidated all the past references of these caves and then described almost all the caves known at that time. He also provided the translation of the inscriptions found in that cave along with its description. It was the most exhaustive account of these caves till that time. Kanaiyalal H Vakil (1932, Rock-cut Temples Around Bombay at Elephanta and Jogeshwari Mandapeshwar and Kanheri) – This included Kanheri caves however it was a brief description. S R Wauchop (1933, The Buddhist Cave Temples of India) – Wauchop mentions that these caves were very much neglected and so little known among the people of those days. He tells that in so large a group there must be considerable differences in the ages of some of the excavations. He started his description from the present cave 1 which he assigns to be the latest unfinished excavation datable to tenth century CE. He describes the Chaitya cave in much detail, providing references from Fergusson. About the single stupa cell outside this Chaitya cave, he also supports the theory that it was the ancient most cave excavated at this site. He dates this cave to second century CE on the basis of Gautamiputra II’s inscription. Then he proceeds to cave X, which he refers as Great Maharaja or Durbar Cave. The raised platform inside the cave would have been used for seating for the monks as per him. From here he mentions cave 16, 35, 66, 67, 68. He comments on some striking features found in these caves, like number of steps and path many of which had hand-rails leading from cave to cave, number of stone seats outside the caves and finally the good and remarkable system of water cisterns which nearly every cave has. Devipriya Valisinha (1948, The Buddhist Shrines in India) – She was the general secretary of the Mahabodhi Society of Sri Lanka. In her compilation, she provided a small reference of Kanheri caves, describing in brief only the Chaitya cave and Darbar cave. She mentions that few characteristics which sets this complex apart from others are, connecting paths were built to make navigation across caves possible, water cisterns and water availability in front of all caves etc. Ruth Wingfield Boosman (1961) – She published a detailed account of the Kanheri caves accompanied with few inscriptions. Her works was supported with a large number of plates. Debala Mitra (1971, Buddhist Monuments) – In her omnibus of Buddhist monuments, Debala Mitra has a small chapter for Kanheri. In preface of her work she admits that due to large number of monuments needs to be covered in her work hence she can only be brief about their description. She mentions that Kanheri has the largest number of rock-cut caves on a single hill among other similar establishment. Though the caves overwhelms a visitor by its numbers but fails the same in case of art and architecture. She mentions that most of the Buddha images are in similar posture, either standing with his right hand in varada-mudra or seated in dharma-chakra-pravartana-mudra. He is also often depicted seated in pralambapada-asana-mudra as well. When Buddha is shown seated above a lotus, its stalk is usually held by a pair of nagas, sometimes accompanied with their female counterparts. She notices the unique sculpture where Buddha is shown seated over a lotus and on its stalk, apart from usual nagas, one a level above is shown Indra (shakra) and Vajra as ayudha-purusha. Divine harpist Pachasikha is also present. Mitra suggests that it represents the tradition of Indra’s visit to Buddha in Indrashala at Rajagriha. Indra went to clarify his doubts with Indra, and his arrival was announced by Pachasikha by playing the harp. She also talks about eleven-headed Avalokiteshvara image which he says is the only one in India. She also talks about the Litany of Avalokiteshvara and says that nowhere in composition is so elaborate and the treatment so elegant as in cave no 90 at Kanheri. A kundika (water-pot) in his left and his right hand in abhaya-mudra is the evidence that it confirms to prescription laid down in Avalokiteshvara-ekadashamukha-dharani for two-armed Avalokiteshvara image. Owen C Kail (1975, Buddhist Cave Temples of India) – In his very exhaustive survey around India for Buddhist cave shrines, Owen dedicated a full chapter to Kanheri. He mentions that the first chaitya cave at the present entrance is probably the latest addition at the site, which might have constructed in eight or ninth century CE. He described many caves at the site, providing details of all the major and important caves. He also described the eleven-headed Avalokiteshvara and attendant Taras. B N Chaudhury (1982, Buddhist Centers in Ancient India) – Chaudhury briefly described the caves in general without going into details of any of the caves, not even to the Great Chaitya cave (cave no 3). He mentions that it is evident from an inscription that Aparasaila sect of Buddhism resided in the monastery at Kanheri. Shobhana Gokhale (1991, Kanheri Inscriptions) – She published a comprehensive list of all the inscriptions discovered at Kanheri. She consolidated all the inscriptions published in previous attempts accompanied with newly discovered inscriptions. She carried out an extensive survey to discover new inscription and to locate the previous published accounts. Her attempt was first such a comprehensive attempt in this direction. She also wrote an article on the eleven-headed Avalokiteshvara image found at Kanheri. More on this article is covered in the next chapters. Dulari Qureshi (2010, Rock-cut Temples of Western India) – This is the latest reference available with me. Qureshi took notice of few past references but not all. She mentions about all important caves, in detail Chaitya cave and Darbar cave. She came up with few new insights like the influence of the Vajrayana Buddhism of Ellora over Kanheri reflecting through many sculptures found here. Dr Suraj Pandit (2013, Stories in Stone) – Dr. Suraj Pandit is involved with Kanheri from a long time. This has been his subject for thesis and he has carried out extensive studies for this site. In his recent book, he has described various caves of this site extensively. We will discuss on his points during the description of various caves in the next chapter. Fletcher, W K (1844). Coutto’s Decade VII, Book III, Chapter X, published in the Journal of the Bombay Branch of the Royal Asiatic Society vol I. American Mission Prees. Mumbai. Hamilton, Alexander (1744). A New Account of the East Indies. C Hitch and A Millar. London. Herbert, Thomas (1638). Some Years Travels into Divers Parts of Asia and Afrique. Jacob Blome & Richard Bishop. London. Hove, Anton Pantaleon (1855). Tours for Scientific and Economical Research made in Guzerat, Kattiawar and the Conkuns in 1787-88. Bombay Education Society’s Press. Mumbai. Hunter, William (1785). An Account of Some Artificial Caverns in the Neighbourhood of Bombay published in Archaeologia vol VII. The Society of Antiquaries of London. Kail, Owen C (1975). Buddhist Cave Temples of India. D B Taraporevala. Mumbai. Legge, James (1886). A Record of Buddhistic Kingdoms. Clarendon Press. Oxford. Mitra, Debala (1971). Buddhist Monuments. Sahitya Samsad. Calcutta. Pandit, Suraj (2013). Stories in Stone. Instucen. Mumbai. Qureshi, Dr Dulari (2010). Rock-cut Temples of Western India. Bharatiya Kala Prakashan. Delhi. ISBN 9788180902024. Stevenson, J (1853). Note on the Rock-Inscriptions in the Island of Salsette, published in The Journal of the Bombay Branch of the Royal Asiatic Society vol IV. Education Society’s Press. Mumbai. Stevenson, J (1857). 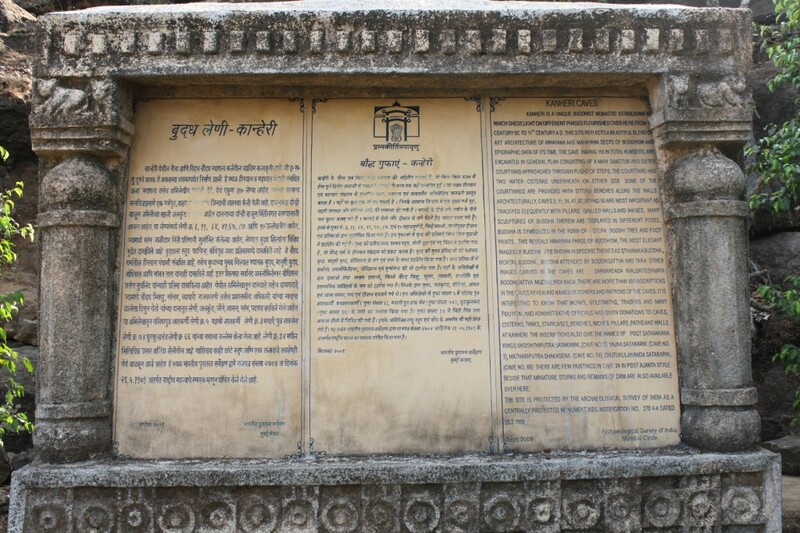 Historical Names and Facts contained in the Kanheri Inscriptions, published in The Journal of the Bombay Branch of the Royal Asiatic Society vol V. Education Society’s Press. Mumbai. Valisinha, Devapriya (1948). Buddhist Shrines in India. The Mahabodhi Society of Ceylon. Colombo. Waucop, S R (1933). The Buddhist Cave Temples of India. Cosmo Publications. New Delhi. West, E W (1862). Copies of Inscriptions from the Buddhist cave-Temples of Kanheri, published in The Journal of the Bomaby Branch of the Royal Asiatic Society vol VI. Education Society’s Press. Mumbai. West, E W (1862). Description of some of the Kanheri Topes, published in The Journal of the Bomaby Branch of the Royal Asiatic Society vol VI. Education Society’s Press. Mumbai. West, E W (1862). Result of Excavations in Cave No 13 at Kanheri, published in The Journal of the Bomaby Branch of the Royal Asiatic Society vol VI. Education Society’s Press. Mumbai.